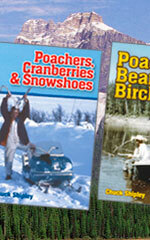 Books for sale POACHERS, CRANBERRIES & SNOWSHOES, POACHERS, BEANS & BIRCH BARK, POACHER CHASER HOLIDAYS and ARTIC TO ALPINE are sold at all major book stores and all the independents in Alberta we could find. Some stores in British Columbia, Saskatchewan and Ontario. 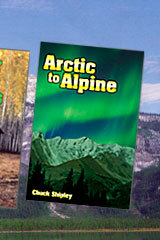 The books are listed on International Book Search sites so any book store may locate the publisher and order. 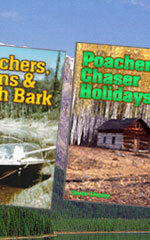 Copies of POACHERS, CRANBERRIES & SNOWSHOES, POACHERS, BEANS & BIRCH BARK, POACHER CHASER HOLIDAYS and ARTIC TO ALPINE may be ordered by regular post through JBS Publishing. Purchase Your Books Through PayPal Here! If you purchase more than 2 books the shipping fee is reduced. Therefore, if you purchase 3 books the shipping is only $15.00 and if you purchase all 4 books the shipping is only $16.00. 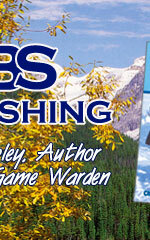 The price for the books and shipping includes the GST. 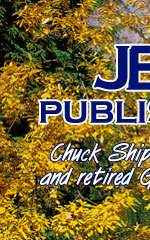 All shipping is regular mail unless otherwise requested for an additional charge.